Continuing on the fraught-drawing, booze-and-bodily fluids theme, here’s a little gem I picked up at a thrift store years ago. It’s got a lot in common with Chris Cascio’s work at ArtStorm. It has the same direct technique: pen on sketchbook paper, and was even in a similar cheap black certificate frame (note the acid yellowing from the cardboard backing). It’s got the same schizophrenic edginess; some parts, like the cat and the table are carefully filled in, the rest is loose, loopy scrawls. 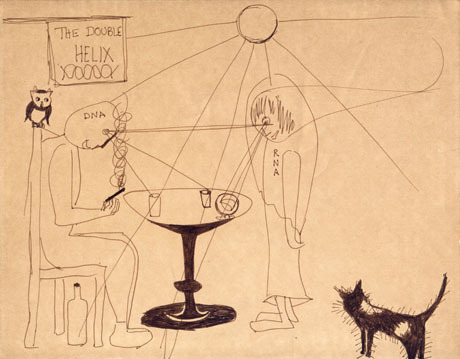 DNA and RNA are in a tavern, appropriately named "The Double Helix." A web of lines connects them, the bottles, the glasses and the sun-like light fixture with mysterious purpose. DNA is authoritative: bigger, enthroned behind the table, smoking, with an owl at his shoulder that peers with a sidelong admonishing gaze. 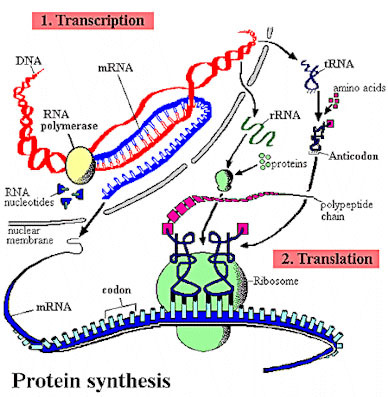 RNA is the acolyte: standing at stiffly like a zombie, wide eyes at hypnotic attention. At his feet, a scruffy black cat radiates bristling fur like a pincusion. But in the hands of the unknown artist/artists, the chemistry of life becomes a sinister occult dance.